This is one app you may want to download. The Apple Watch just got a whole lot more indispensable! Today, two major heart-related developments mean Apple’s wearable device could one day save your life. Firstly, Apple teamed up with Stanford Medicine to launch an Apple Watch heart app that looks for deadly atrial fibrillation. It alerts users when they experience irregular heart rhythms, and can actually get them help. Meanwhile, the Food and Drug Administration finally approved AliveCor’s Kardiaband EKG reader. It’s the first medical device accessory for the Apple Watch. Apple’s collaboration with Stanford focuses on irregular heart rhythms, which can be fatal if untreated. This condition, called atrial fibrillation or AFib, is responsible for approximately 130,000 deaths and 750,000 hospitalizations in the United States every year. Because a lot of people don’t experience symptoms, AFib can go undiagnosed. To measure heart rate and rhythm, the Apple Watch’s sensor flashes green LED lights several hundred times per second. The device also uses light-sensitive photodiodes to detect the amount of blood flowing through the wrist. Using artificial intelligence, Apple Watch can isolate heart rhythms from other noise and identify irregular heartbeats. If the smartwatch identifies an irregular heart rhythm, the wearer receives a notification on their Apple Watch and iPhone, a free consultation with a study doctor, and an electrocardiogram (ECG) patch for additional monitoring. 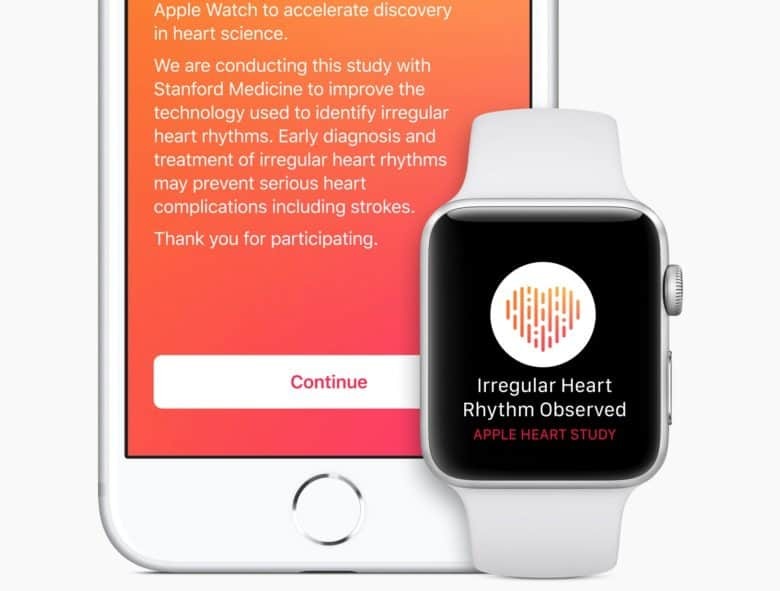 The new Apple Heart Study app is available now for Apple Watch Series 1 and later owners who live in the United States and agree to participate in an associated study. AliveCor’s Kardiaband EKG reader, meanwhile, also monitors for atrial fibrillation (AFib), but via an accessory. The Kardiaband fits into a slot on the Apple Watch band, letting users get an EKG reading discreetly just by touching the band’s integrated sensor. While Apple’s existing hardware can detect irregular heart rhythms, the specialized Kardiaband goes one step further by gathering medically approved EKG measurements. It’s this peer-reviewed approach that has won it officially FDA approval. If you’re interested, you can buy a Kardiaband starting today for $199 on AlivCor’s site. You’ll also need to subscribe to AliveCor’s premium service for $99 a year. Want to protect yourself as well as possible? Why not buy AlivCor’s hardware and download Apple’s app, too?